...And the heroes of Golden Sun have been abandoned. Now, the world is falling into darkness. A new band of adventurers is the world's final hope... but they may also be its doom. Pursued by the heroes of the original Golden Sun, they must race to complete their quest before the world becomes lost to the ages. Continue your quest or start anew! 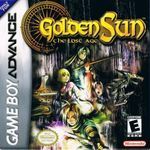 If you completed the original Golden Sun, transfer your powered-up party into Golden Sun: The Lost Age. But even if you're new to the series, Golden Sun: The Lost Age makes the perfect first step on your epic journey! Go head-to-head with a friend! Link up a Game Boy Advance Game Link cable (sold separately) and challenge a friend's party in a one-on-one test of might!